Are you searching for roofing in Celina, TX that is affordable as well as reliable? Call (833) 200-0571 now to reach ECO Commercial Roofing for any and all of the roofing services you need! Customer service is a number one goal of ours, and we can provide you with nearly any type of roof assistance you may need. We are participating members of our community, and we have been dependable Celina roofers for a long time now. Our roofers are very knowledgeable on the many kinds of roofing, and we are glad to assist you with any of your roofing questions or concerns. Finding a dependable roof contractor is always simple when you rely on ECO Commercial Roofing! When it comes to services for your home or business, a trustworthy contractor is an essential asset. To provide you with that peace of mind, we use top quality products from Conklin, and we educate all of our roofers to the industry standards. Choosing a roof can affect the price of your property, so we provide a wide selection that allows you to determine your ideal match. When picking, remember that while the style plays a big role, that the long term benefits also require serious consideration. The type of roof you choose will ultimately rely on your budget, as well as the kind of building you are needing to protect. Our crew is glad to provide you with plenty of options. We are glad to assist you with any and all of your roofing needs, from repairs to installations, and anything in between. Our experience allows us to service any kind of roof, which includes commercial, industrial, and residential too. Typically oriented towards flat roofs and low slope roofs, our commercial services are the ideal choice for many business owners. When you need your flat roof to last without any further issues such as leaking or ponding, specialized installation will be required. Industrial roofs, though similar to commercial roofs, typically require stronger materials, as well as highly skilled installation to ensure longevity. Finally, we also provide dependable and cost-effective residential roof services in a wide selection of styles. Roof restorations are our primary specialty, so we are no strangers to roof coatings. From experience, we can assure you that we only utilize high quality products such as Conklin, as that makes sure our roof coatings are reliable and resilient. When you need improved roofing in Celina, TX, you can depend on us to provide you with unmatched craftsmanship, and top quality services. If you are interested in discovering more about how roof restoration with Conklin coatings can prolong the life of your roofing system, give us a call now at (833) 200-0571, or look into the links provided! If you are looking to fix minor damages on your roof, as well as to defend it from additional damages, a roofing restoration is a great place to start. We utilize Conklin roof coatings in the majority of our restoration processes, and with such coatings you can usually gain another 10 years for the lifespan of your roof system. Picking a roof restoration from a reliable contractor will conserve your time and money when compared to a total roof removal and installation. We generally perform our roof restoration with quality roof coatings from Conklin. Such coatings are available in a selection of different materials, and we’re able to help you determine which one will work ideally for your requirements. Various coatings deliver varying levels of adhesion, flexibility, and moisture resistance. 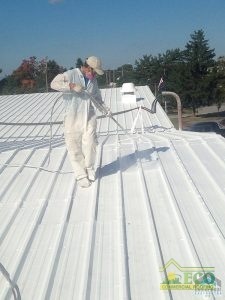 Generally, we can even install the roof coating without taking off your previous roof material. Call (833) 200-0571 to speak with a roofing professional about your roof coating options. 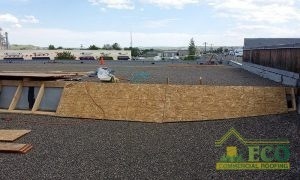 Our flat roofing services are designed to help out several different types of commercial roofing, such as low-slope as well as flat roofs. The best way to prevent leaks and punctures is to properly install the roof in the first place, which our experts can assist you with. When we create a flat roof system for a client, we craft that solution to protect and serve their building for years. Contact ECO Commercial Roofing if you need residential and commercial roofing service you can count on to defend your roofing system for decades. You can locate our professional services and quality roofing in Celina, TX, as well as in the surrounding cities. Every building can benefit from the installation of a high quality roof investment. Give us a ring today at (833) 200-0571 with roof questions, or if you’d like to schedule an appointment with our qualified roofers.